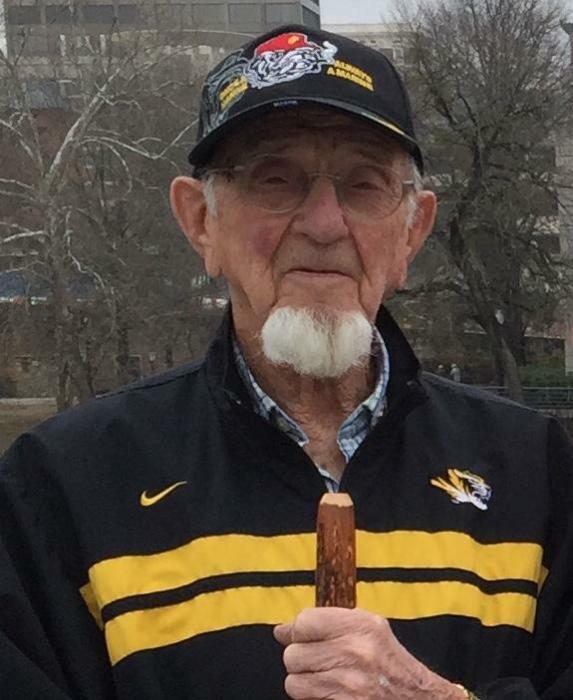 Louis Randall Ayers, 97, of Green City, Missouri, went to meet the Lord on Tuesday, November 27, 2018. Louis was the oldest child and only son of Frank Merritt and Mildred Filmona Harlan Ayers and was born in Fairbury, Nebraska on August 29, 1921. On January 20, 1947, he was married to Doris Jean Martin in Olathe, Kansas. She preceded him in death July 16, 2016. He was also preceded in death by his parents, one sister, Helen Louise Seymour, and one nephew, Stanley Bodine. He is survived by one son, Philip (Julie) Ayers of Kirksville, two daughters, Janet (Daniel) Adam of Monroe City, and Dr. Constance Ayers (William A. Foster) of Friendswood, TX. Also surviving are seven grandchildren, Martin Ayers, Jessica Hobbs, Kimberley Ayers, Samantha Ayers, Regina Gottman, Alexander Gottman, and Maxwell Gottman, nine great-grandchildren, one sister, Marian Bodine of Faribault, MN, five nephews and one niece. Louis grew up on a farm on Spring Creek north of Green City, attended the Harlan School and graduated from Green City High School in 1937 at the age of 15. To celebrate his graduation, his parents took the family on a trip through the western U.S. thus beginning his love of traveling. In 1938, he hitchhiked west working his way to Colorado and back, living an adventure spurred by a comment from the superintendent of schools at Louis’ high school graduation. In 1941, Louis went to Chicago to work. After World War II broke out, he went to enlist in the Navy at the Chicago Post Office. The line for the Navy was long and the line for the Marines was short, so he became a Marine. After basic training in San Diego, Louis completed coursework at Utah State University in Logan, Texas A&M in Corpus Christi, and University of Central Florida at Orlando related to radio and radar theory and operations. He completed training at Cherry Point, NC and shipped out of San Diego for the South Pacific. He landed in New Caledonia and was assigned to VMF-211, the Wake Island Avengers. He then went to Guadalcanal, Rabaul, New Ireland, Bougainville, and Emirau Island. While at Bougainville, Louis engaged in multiple combat operations and instructed the VMF 211 Avengers and Charles Lindbergh in the use of the radios and the Identification Friend or Foe system in the F4U Corsair. After 22 months service in the South Pacific, he returned to Guadalcanal where his combat tour ended. Louis attended the University of Missouri-Columbia on the GI Bill and graduated with a BA in Physics in 1950, the year President Harry Truman gave the MU commencement address. He became a Rural Letter Carrier in 1953, carried the mail for 32 years, and retired in 1985. He was a lifelong farmer on the Spring Creek farm where he was raised. He was gifted in mathematics and helped many local students over the years with their mathematics studies. Louis was a member of the Green City United Methodist Church, King-Walker-Custer Post 365 of the American Legion, Pollock Masonic Lodge, and the Moila Temple of the El Kadir Shrine. Louis will be remembered for his many interesting stories, his ability to make people smile, his love for the United States Marine Corps, and, in his later years, his slow, leisurely drives to Spring Creek. His family remembers with gratitude and love the many family vacations across the United States where he shared with them his sense of adventure, wonder, and curiosity. Funeral services will be held 10:30 A.M., Saturday, December 1, 2018 at the Ruschmeier Funeral Home in Green City. Burial will follow in the Mt. Olivet Cemetery in Green City. A visitation is scheduled for 5:00 P.M. to 7:00 P.M., Friday evening at the funeral home. Memorial contributions are suggested to the Green City United Methodist Church or Northeast Missouri Hospice.